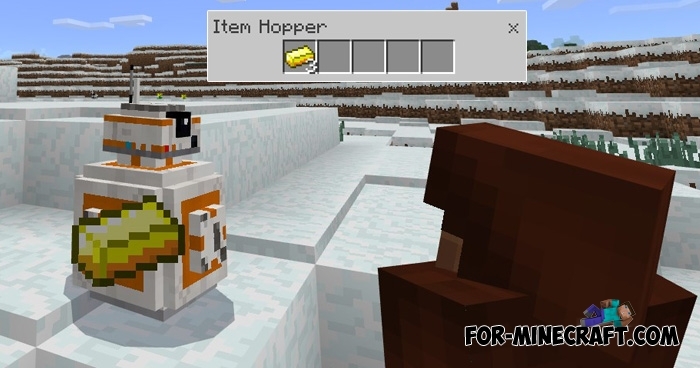 Currently there are no mods or texture packs for the latest version of MCPE in the style of the Star Wars. But thanks to the Star Wars companion addon you get a great companion of this film which is able to perform quite useful functions. His name is BB-8, and it can be tamed and used as you want. A nice feature are the new items such laser swords, clothing and laser bullets. First you need to find BB-8 and tame it. This is not as difficult as it might seem at first glance. Just explore the world and at any time you meet him. Then give him the Redstone, and it will be your companion. One of the main functions is to gather items from the ground. BB-8 can go and collect all the falling objects at the same time. Inventory consists of only 5 slots, but it will be enough if you just kill mobs or cut the trees for example. In the case when the enemy attacks you, BB-8 instantly becomes your defender. Tame as much as possible of these droids and they will be invincible army. Creator is Gona, so your new friend has additional features such as resistance to fire and the restoration of health using Redstone. Actually the Star Wars companion will appeal to many players because where else you will find such a nice and at the same time a useful helper.